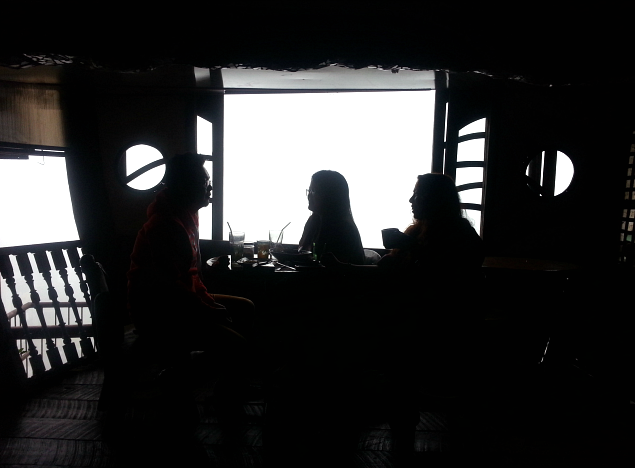 What we really wanted to do in Baguio was just to chill. Just go around the city without any pressure to be anywhere on a specific time. We did not plan to go the places frequented by most people (the likes of The Mansion, Botanical Garden, Strawberry Farm, etc.) and we (I especially) just want to go on food trips. On our second day, boy, we really did binge eat. Hahaha. 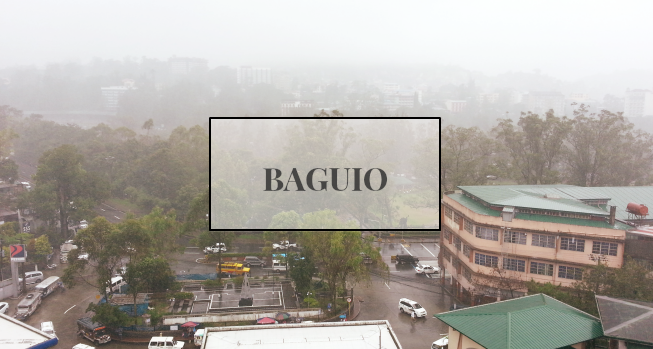 It's such a drag waking up early in the morning in Baguio. 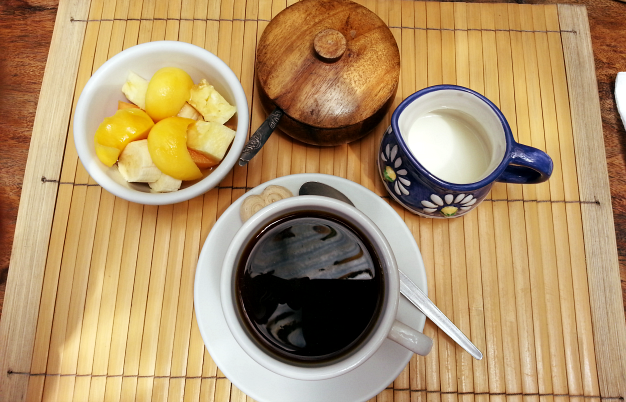 You just want to stay in bed all day, read books and just get up to get your daily caffeine fix. But, of course, that was not the kind of chill we had in mind. 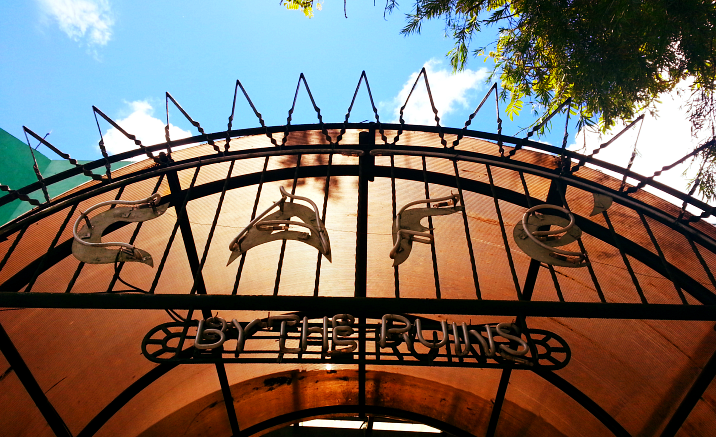 First stop for the day was Cafe by the Ruins for brunch. 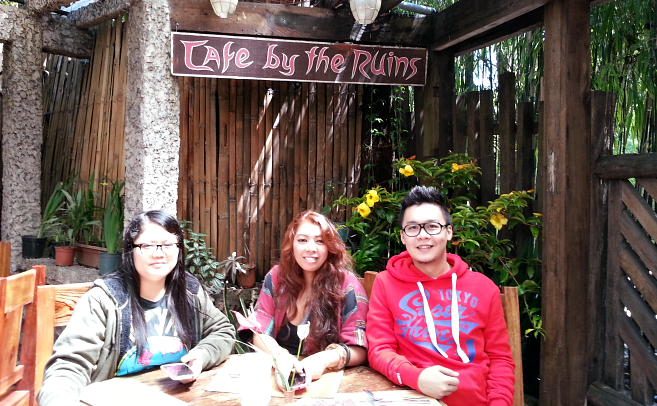 Sadly, my previous Baguio trips with my family didn't include Cafe by the Ruins. We were always a big group so my uncles and aunts would usually cook food instead of eating out. Ian was raving about this place so I was really eager to try their food. It reminded me of a cross between Bag of Beans and Sonya's Garden. 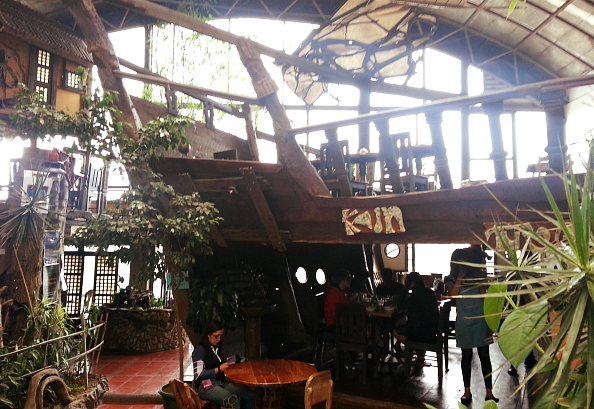 It's one of those restaurants that's already got character because of the design of the place and the ambiance it exudes. Very rustic and cozy. It was called Cafe by the Ruins because the place was built on the ruins left behind by World War II (yes, there's a wall with bullet holes or something.) Unfortunately, all the historic charm of the place is dampened by Eurotel which is right beside Ruins. Boo. I've read a lot of negative reviews recently about their food and service. 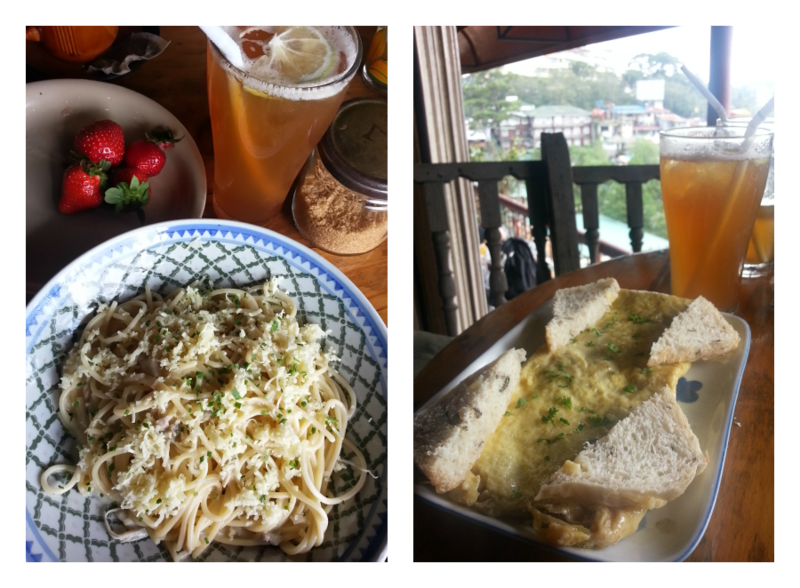 I think it's a good thing we came to Baguio during off peak season because food was really great as well as their customer service. I really enjoyed what I had. And I think starting your day with something that looked like what he had above makes your day already better, right? 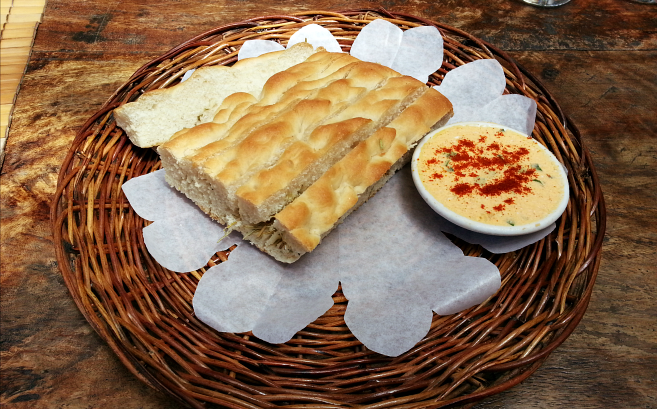 I also loved the Focaccia bread and even more the herb cheese dip. I should learn how to make that! The mandatory group picture. Hehe. After that scrumptious meal, we headed to the market for the first round of buying pasalubong. No photos of that because, well, I didn't bother taking pictures. Okay. Maybe just this one. Because I totally thought the sign said Bagnet. HAHAHA. Now that we've swept all the stalls for things to bring home, Muffet recommended we go to Oh My Gulay and just hang out there for the rest of the afternoon. 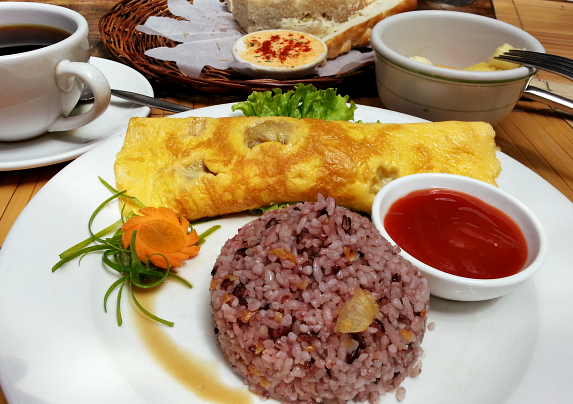 Oh My Gulay is located at La Azotea Building along Session Road. And I think no Baguio trip would ever be complete without trying out this place.You have to climb what seemed to be an endless staircase (at least I think it is because it's on the 5th floor) but rest assured, it would be all worth it. I felt like I was Alice and I fell down climbed up a rabbithole (if that's even possible) and found my Wonderland. For first timers like me, Oh My Gulay (and the stairs leading to it hahaha) is absolutely breathtaking. I had a hard time wrapping my head around the thought that all of these fit the 5th floor of a, from the looks of it, small building. Hahaha. My jaw was left hanging open while I looked around the place. Everything looked so amazing and beautiful! Can't get over it. I was absolutely mind blown. 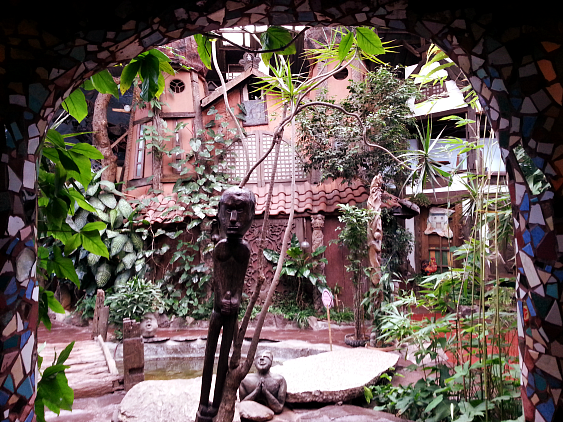 There were wooden sculptures, paintings, furnitures; the way everything was just creative and unique, even the way they name their dishes. Be sure to sit by the window so you could enjoy the panoramic view of Burnham Park! 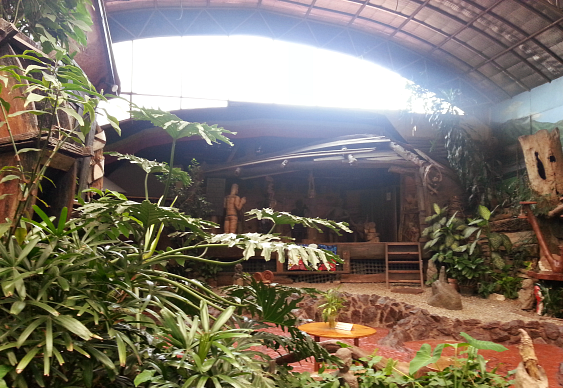 Oh My Gulay is owned by Eric de Guia (Kidlat Tahimik) and is also an art space for presentations, concerts and a place for exhibits of traditional Igorot culture. Instant source of inspiration! Ian's Kabute pasta on the left and my Sibuyas Kabute omelette. Food was good and very, very affordable. 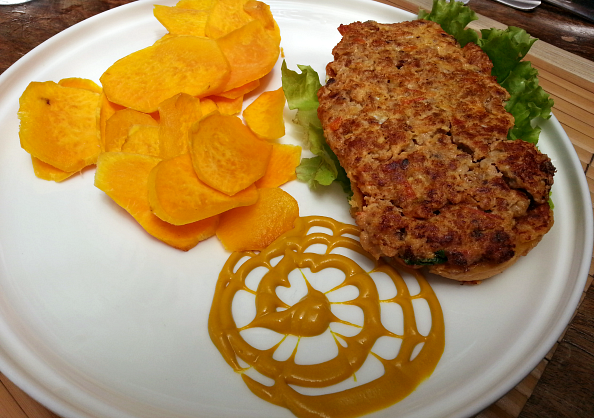 By the way, they offer vegetarian dishes here but don't fret because they still have quite a variety in their menu. My favorite would be the Dayap iced tea. You must try it when you pay a visit to this place. 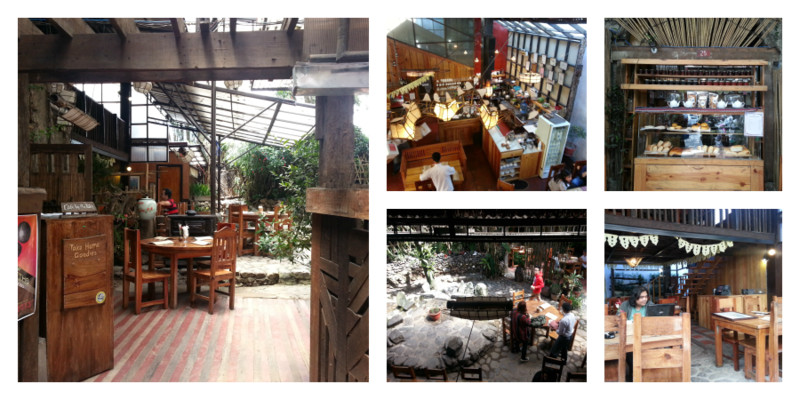 Oh My Gulay is one of the best restaurants I've been to and it's easily become one of my favorites in Baguio. There's so much going on in there, I'm sure your curiosity will be thoroughly fed. We spent our entire afternoon there just laughing the day away. And because the place was so beautiful, we had a lot of photos taken there. Hahaha. After spending an entire foggy afternoon of chit-chats, photo taking and just kicking back and relaxing, we decided to go the night market at Harrison Road (in front of Burnham Park) as suggested by Muffet's friends. It's a good thing we decided to ask some of her friends who were locals which places to go to because otherwise, we wouldn't have known of these other great nooks worth the visit. The other side of Harrison Road is closed for this daily (or nightly!) 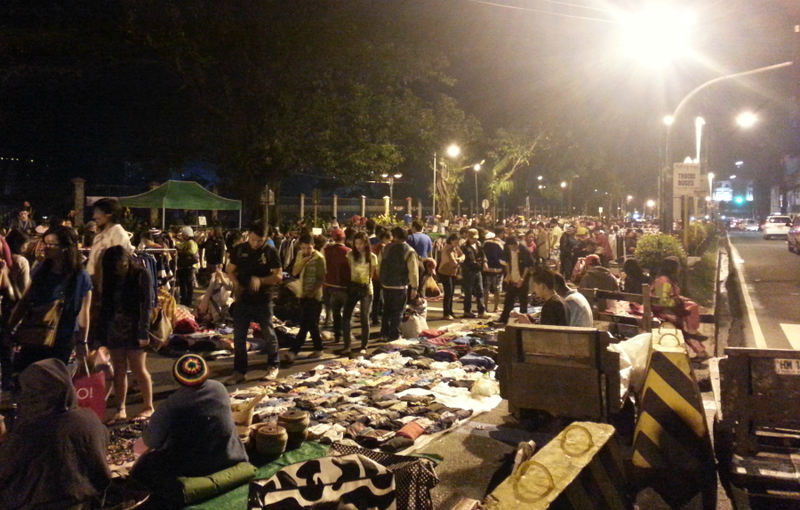 night market which extends from almost end to end of the street. If you're planning to buy the usual pasalubong, you'd rather go here than to the public market. They offer everything dirt cheap and you can even haggle with the prices. 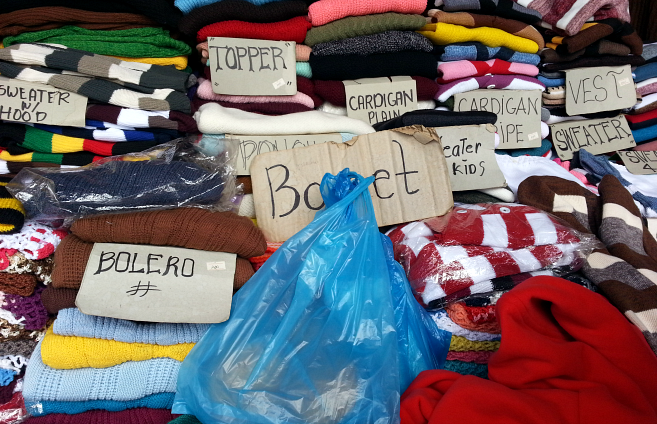 There's a lot of ukay-ukay pieces, and they offer brand new signature clothes, jackets and bags, too! And for our final stop to cap off our night, a quick dinner at Pizza Volante. It's about 11:00 PM and I was already so sleepy. Good thing Pizza Volante in Session Road is 24 hours! 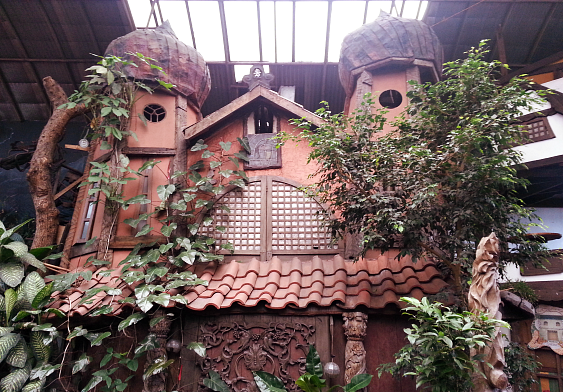 I grabbed this photo from another blog because I had no other pictures of the place. Hehehe. When we went there, there was actually a lot of people, glad they had a second floor to accommodate more people. As far as I can remember, Pizza Volante is not airconditioned and the ambiance is, let's say, a bit drab. Of course we had to try the pizza. You're insane to eat at an Italian restaurant and not try their pizza. 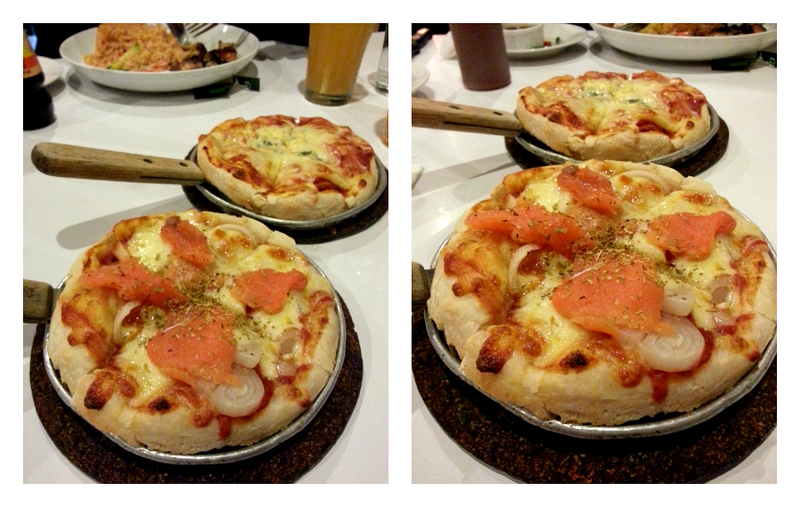 We got Smoked Salmon Pizza and Four Cheese Pizza, both in 8-inch sizes (or was this 6?). I also remember ordering Grilled Tanigue with Corsica rice, Ian ordering pesto and Muffet ordering salad. No pictures because well, the pizza is the star. Haha. 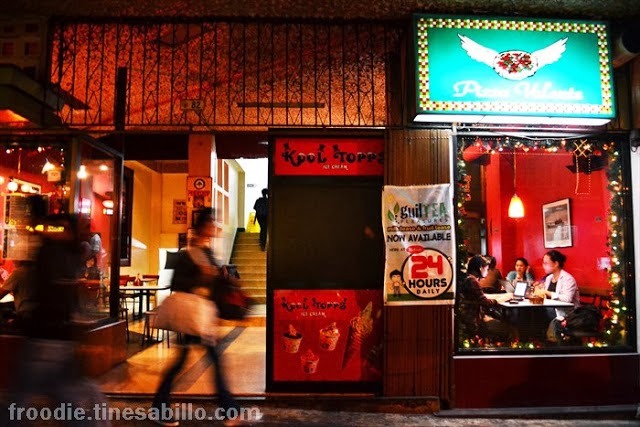 One thing you have to commend Pizza Volante about is their variety of pizza flavors. From the basic Pepperoni and Mushroom to Tuna Pizza, Chili con Carne Pizza, Brockwurst Sausage and Onion Pizza, even Sardines and Mushroom Pizza! Another thing is that they cover everything from breakfast food, pasta, salads and soups, they even offer lamb and other steaks! The rice meal I ordered was just okay. Pizzas were great! The crust was soft and chewy which is perfect, the fillets of salmon perfectly sized for each slice, smoky and succulent; the mozzarella cheese was stringy and flavorful, all with a dash of spices on top. This is where you'll get the best pizza in town. Seriously. The service was quite slow but I could say that it was worth the wait (but I do hope they do something about their speed of service). Sitting here, 5 months from that night, I am making a mental note to remember to visit the other branch in front of Wright Park (which looked cooler) next time.